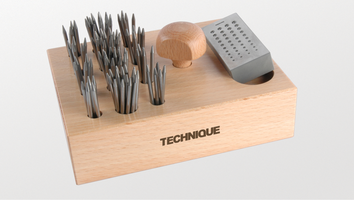 TECHNIQUE™ is a range of tools, abrasives and consumables for use in Jewellery manufacture and repair. All products share a common value of quality, reliability and performance, and are part of the wider ASIC selection, a comprehensive product range created from over 30 years of worldwide experience combined with 100% Swiss ingenuity and creativity. Master beading tool sets. A comprehensive set of 100 beading tools now available in two assortments. 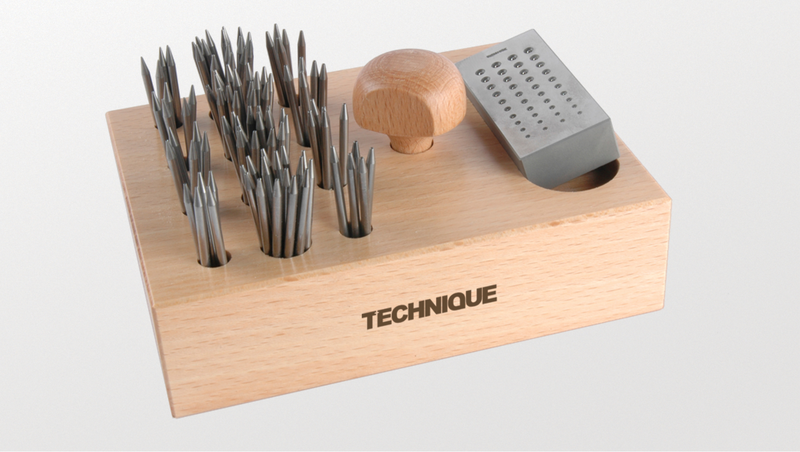 Complete with redesigned wooden base, hardened fion and beading tool handle. 100% Swiss expertise makes these the best sets of their type. A complete set of 36 polished bezel punches from 1.5 – 20mm. Supplied with both mushroom and pear shaped handles complete in a wooden box. A range of mandrels perfect for making jump rings and other small findings. Ground and hardened in Germany to an exceptional finish. Aluminium oxide paper combined with Scotch-Brite™ to give a perfect finish. The unique design of the buff makes them easy to use on even small rings, and the range of grits give a wide spectrum of finishes from matt to superfine. These ultrasonic tanks offer reliability, performance and a great price point. The tanks are manufactured in stainless steel (SUS303 &430) and all feature industrial strength transducers with 2 year warranty.